We supply a wide range of POS Products & Hardware – from All-in-One Touchscreen Terminals, PC’s for POS with separate Touch screens, or normal LCD monitors, plus all the peripherals that plug into POS. Popular products we generally have in stock, others we order in. 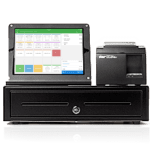 TIP: Choosing the right POS hardware should only be done AFTER choosing what POS Software you are going to use, as many software solutions will determine a hardware choice. For example, many hospitality software solutions, due to environmental situations, have serial connections to printers and USB will NOT always work on these sites. We have a vast range of accessories (called peripherals) available and only our most common are listed here. If you do want a specific model not listed, please ask us to source this for you as there are way too many models to list on our website.